Here they are guys, my secrets for making the best lasagne ever. 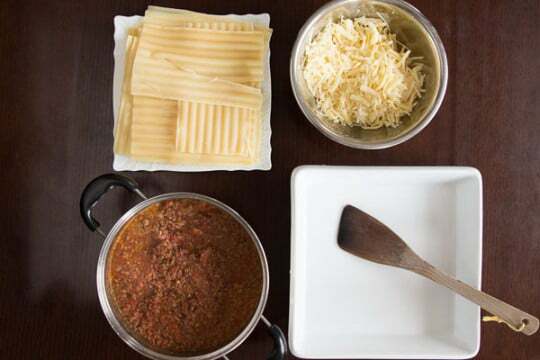 These five simple tricks will elevate your lasagne game to the next level. Growing up, in a Japanese-American household, we had an interesting mix of foods that graced our dinner table. It’s only after I left home that I came to recognize them as comfort foods. Mac and Cheese didn’t make the list, but Japanese Curry and Spaghetti with Meat Sauce were some regulars. Lasagne is another classic comfort food that made it onto our dinner table for special occasions and to this day, it’s one of my all-time favorites. 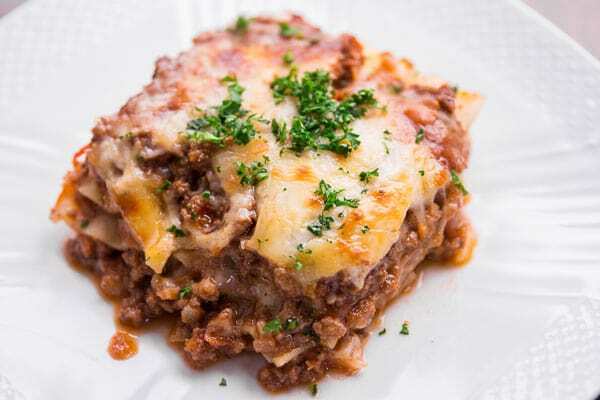 With a savory meat sauce, between layers of tender noodles that have absorbed all the great flavors of the sauce, and a caramelized layer of cheese on top, it may very well be the ultimate comfort food. Recently, I was tasked with cooking for a large family gathering in Japan that involved both older folks and young kids. Flipping through my mental rolodex of crowd-pleasers, Lasagne quickly floated to the top of the list. When I realized I’d never shared my lasagne recipe with you guys, the decision was made. I knew I made the right choice, when I saw a 90 year old Japanese grandma, who’d probably only eaten pasta a handful of times in her lifetime, clean her plate with a contented expression on her face. The only bummer was that the casserole dish was practically licked clean by the time I went back for a second slice. Next time I’m doubling the recipe! If you’re wondering where the ricotta is, it’s a personal preference. For me, adding ricotta makes lasagne far too rich to eat more than one slice. My version takes a more balanced approach between the cheese, pasta and sauce, which will have you going back for seconds and thirds. My version of Lasagne isn’t very complicated to make, but there are a few closely guarded secrets I’ve integrated over the years that set it apart from the rest. Use a mix of meat – I use a 5:2 ratio of beef to pork, but you could also make this with Italian sausage, or even minced bacon. 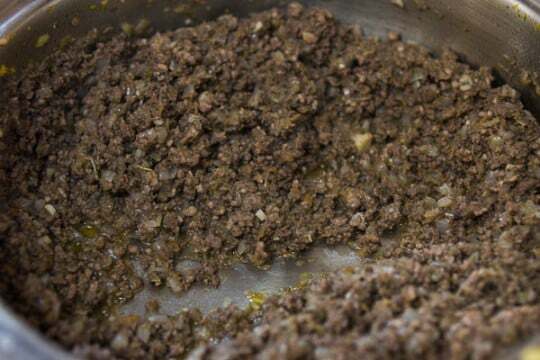 You want enough beef in the mix that it has a solid beefy flavor, but adding in some pork brings depth and umami to the mixture. Mushroom powder – Dried mushrooms have a boatload of umami compounds and when powderize they make a great natural alternative to MSG. I grated in a dried shiitake mushroom with a microplane, but porcinis would work great as well. Add sweetness – Because most canned tomatoes lack the sweetness of sun-ripened tomatoes, I find sauces made from them often taste tart and one dimensional. This is easily corrected by adding a grated carrot. It not only contributes a wonderful vegetal flavor, it adds sweetness naturally without using refined sugar. 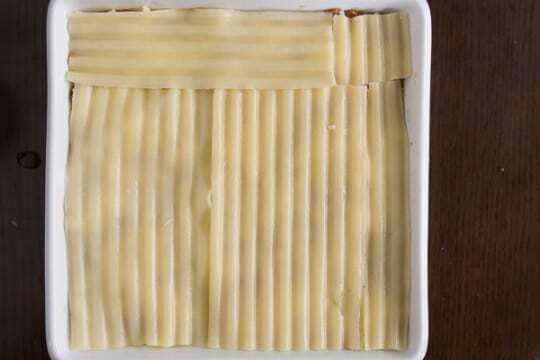 Parboil the pasta – Some recipes call for assembling lasagnes using uncooked pasta. This makes the pasta absorb most of the liquid from the sauce, making it dry and gummy. On the flip-side, cooking the pasta for the time specified on the package results in a lasagne with soggy noodles. That’s why I like to par-boil the noodles for about 3 minutes less than what the package directions specify. This removes the excess starch and allows the noodles to plump up, but they’re not fully cooked, so they don’t get too soft while the lasagne bakes in the oven. I don’t usually add oil when boiling pasta, but for lasagne I make and exception because the large surface area of the noodles will make them stick together, and they become almost impossible to separate. Use a mix of cheese – While most recipes call for using Mozzarella in Lasagne, mozzarella contributes very little flavor because it has not been aged. That’s why I like using a mixture of Mozzarella with Gruyere (you can also use Comté). Its a melting cheese that’s aged for 3-10 months, giving it a rich nutty flavor that lends the Mozzarella a helping hand. Oops, there go my secrets… but hopefully you’ve learned a trick or two. 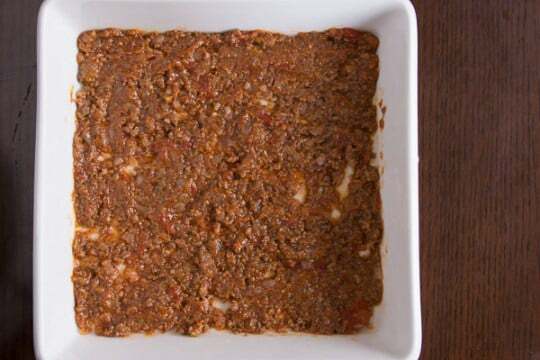 You can make the sauce a few days in advance and store it in the fridge, but boil the noodles and assemble the lasagne the day you plan to serve it. This gives the flavors in the sauce a chance to meld without making the noodles soggy. It should also give you enough time on the day of your dinner to crank out a few other dishes to impress your guests. 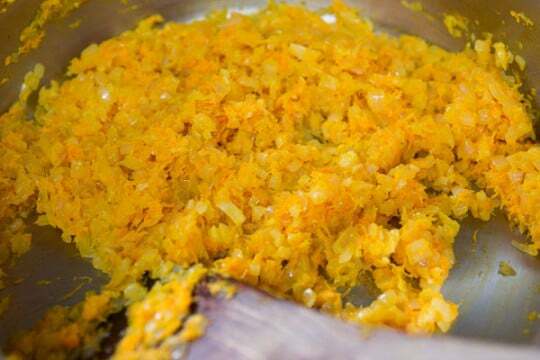 Add the olive oil to a large pot along with the onions, garlic and carrot. Cover with a lid and cook over medium low heat until the onions are soft and translucent. The moisture released by the vegetables should keep them from burning, but if they start burning, turn down the heat and add a little water. 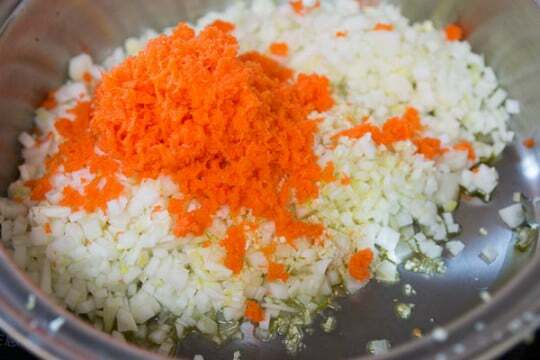 Once the onions are cooked, remove the lid and turn up the heat, sautéing until the mixture is 1/3 the original volume and starting to caramelize. 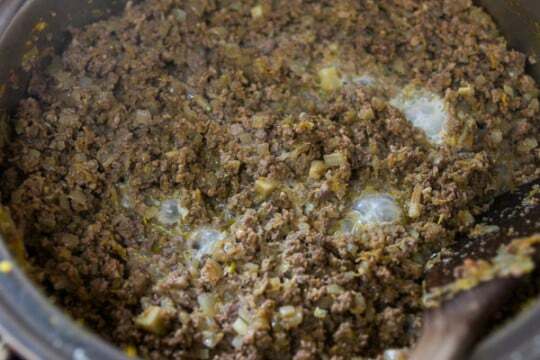 Push the vegetables to the sides of the pan, turn up the heat to medium-high and add the ground beef and pork. Use a spatula to break up the clumps. 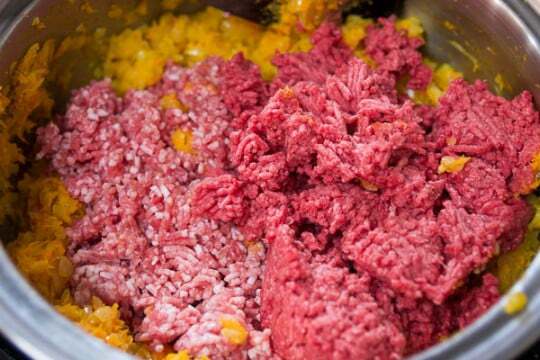 Add the milk and boil, continuing to break up the clumps until the beef is cooked and there is no liquid left. Add the wine and boil until most of the liquid has evaporated and there is no smell of alcohol remaining. Add the tomatoes, using your hands to crush them into small pieces, and then add the tomato paste, salt, oregano, and black pepper. Use a microplane to shave the dried shiitake into the pot (you can also put the dried mushroom in a spice grinder and powderize). Simmer the sauce over medium low heat until it is thick (30-40 minutes). Generously salt a large pot of water and add a teaspoon of olive oil. Bring the water to a boil, then cook the pasta 3 minutes less than what the package directions say. My pasta said 9 minutes so I cooked it for 6. Place the oven rack in the top position and preheat to 350 degrees F (180 C). Put the Mozzarella and Gruyere in a bowl and toss to distribute evenly. To construct the lasagane, put down a layer of sauce that's just thick enough to cover the bottom of the dish. Cover with the parboiled pasta, cutting the pasta as necessary to fill in the spaces. Repeat so that you have 3 layers of pasta. Once you have 3 layers of pasta, finish by spreading the remaining meat sauce on top of the last layer of pasta. Cover with enough cheese so that you cannot see any sauce underneath. 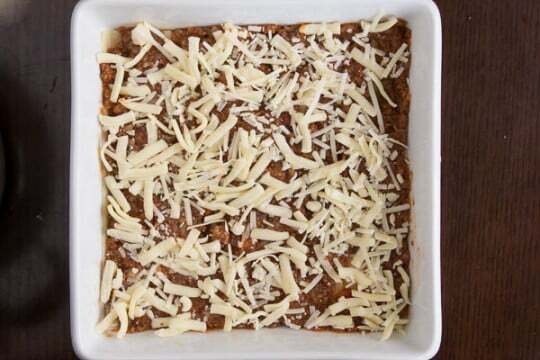 Put the lasagne on a baking sheet to catch any spills, then place it in the oven. Bake until the sauce is hot and bubbly and the cheese has browned on top. If the sauce has been bubbling for a while and the cheese is not getting brown, turn up the heat to 450 degrees F (230 C) to finish it off. When the lasagne is done, take it out of the oven, garnish with minced parsley, and let it rest for 10 minutes before cutting and serving. This recipe looks delicious and the mushroom powder addition is genius! I never thought about using mushroom powder. I’ll have to try that. 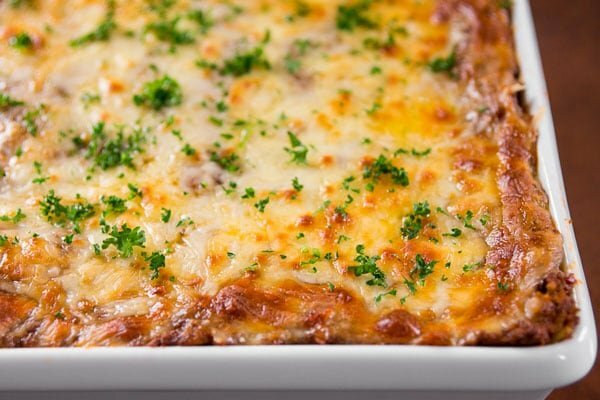 My go-to for topping a lasagna: add a final thin sprinkle of bread crumbs mixed with parmesan. It adds a little bit of a crust that is oh-so-tasty. Love your tips, especially grating the dried mushrooms. Not sure if I can part with not including a béchamel layer though! Great tips! I always have carrots (usually more than one type of vegetables) in mine and a mixture of Mozarella, Cheddar and Parmesan (Gruyere is such great idea too!). Instead of parboiling the noodles, I just make sure the meat sauce has extra moisture. I will try the mushroom powder next time! This looks phenomenal! Also, I like the idea of adding carrot. Would give it an extra touch of veggies too. I’ve never thought of mushrooms as tasting salty though. Then again, I’ve never tried a shiitake. This is a nice twist. I always use a carrot for my sauce too, but never mushroom powder. Great idea. Since Mozzarella is bland I add in provolone, but the gruyere idea is great too. I know I would love this. Did I miss it?…. Didn’t catch what temperature to bake the lasagne at? I enjoyed reading about the story of your grandma. 🙂 My 92 yo grandma mainly eats washoku too but I’d be fun to see her eat lasagne! Dried shiitake mushroom and carrot addition for lasagne is a wonderful idea. I put them in my meat sauce too. You powderize the mushrooms yourself, so as long as you trust the dried mushrooms you buy (or dry them yourself) you should be fine. I called it natural MSG because mushrooms have a high concentration of glutamic acids, it’s what MSG is meant to mimic. Nope, my recipe platform is just broken, it keeps erasing steps. Sorry, should be fixed now. Can’t wait to try making this. What if you’re making your lasagna with fresh pasta? Do you par-boil that too? Hi Matt, if you’re using fresh pasta there’s no need to par-boil as it already has a high moisture content. 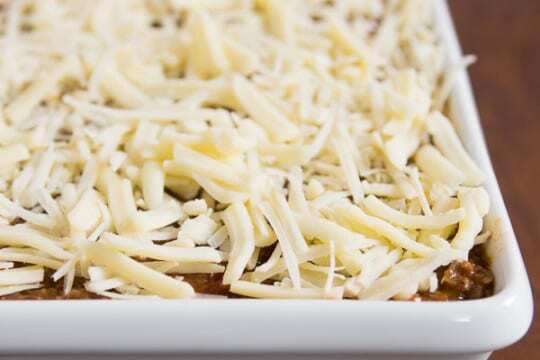 I do recommend however that you wash the flour off the outside of each sheet as you layer it into the lasagne (don’t do this in advance or all the pasta will stick together), otherwise the extra starch tends to make the finished lasagne gummy. Your blog is a godsend to a newbie cook like myself. The detail and (beautiful) pictures really minimize the places I can mess up. The pictures also make it easier to convince my roommates to chip in for ingredients so they can have some of the final product. My favorite lasagna is made with noodle sheets fresh off a noodle roller. If you have a roller, it doesn’t take that much longer, but it makes for a much softer casserole. 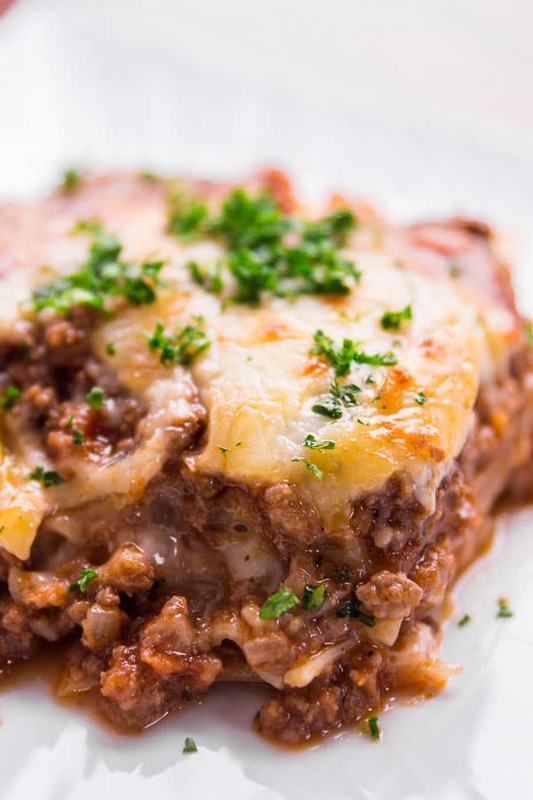 I grew up Chinese-American, and lasagne was one of the few American dishes my mom appreciated, so it wins a place in my heart as a comfort food. As a native of “Franche-Comté” let me tell you that Gruyère isn’t know as Comté. Two really different cheeses ! two different places, but it’s close enough to be substituted, as opposed to using cheddar or gorgonzola (which really are different cheeses). Thank you for sharing this recipe. I’m looking to try this out very soon. I also love your photography, makes for a great article. I made this yesterday for my husband and he loved it (so did I). The sauce is really wonderful and not at all what either of us are used to. We are used to heavy red sauces so this was a nice change. It took so little time to prepare too. I’m used to spending half a day on lasagna. Thank you so much for your wonderful blog. This is the third dish (beef teriyaki, meatloaf) I’ve made from your blog now and all have been hits! It’s in the oven, thanks for the concept! I had italian sausage on hand, and some fresh tomatoes that needed to be used plus a jalapeño before it went bad…sauce is great and I smoked some mozzarella and mixed some edam and parmesan…. It turned out great! Love lasagna but rarely make it because I’ve always made the “full monty” with ricotta and several layers and I try to eat a littler lighter than that usually but this is nice and light comparatively…..thanks again! Made this last night following your directions exactly…It came out really good! Do you have anything that would you recommend as a good alternative to red wine for this dish? I don’t really buy or keep red wine on hand since I don’t drink and it would be pointless to buy a bottle without using it all. Thank you! Hi Lili, you could use beef or chicken stock instead. Hi! This looks great and I would love to make it (I, too, am not a fan of the ricotta, oh-so-rich versions). Judging by the picture you used a 9×9 baking dish, is that correct? Sorry if I missed where you specified the size. Hi Michelle, nice catch, I didn’t mention the size. I’m actually not in the location I shot this right now so I don’t have access to the dish to measure it, but I remember it being a little bigger than 9×9″. Looks great! The carrot and mushroom powder are awesome ideas! The first piece is always a challenge, but if you a have a sharp knife and a spatula you should be able to get all the subsequent pieces out okay. One thing we’ve found works well, for added richness, is adding a little bit of liver to the mix. Btw…my grocery store didn’t have stewed tomatoes so I used whole peeled san marzano tomatoes (2 x 28oz since doubling recipe) with the seeds and also poured in all the sauce in the can. Some brands of tomatoes have more salt than others, which could be part of the problem. If there’s no sauce at all, you can try adding some water back in to make it more saucy and reduce the saltiness. Or if you have another can of tomatoes you can try adding that. I made the sauce In advance for tomorrow. I did put in x2 of dried shiitake. I don’t think I can wait til dinner. Made it about 10 times now…. Wow, this is the best lasagne I’ve ever had, let alone cooked, thank you. Today is 23rd day of 2015. Made this lasagna for my mother’s 88th birthday dinner and it was a total hit! Best lasagna I’ve ever made, hands down. Having 5 kids I’ve done lasagna many ways many times but what has finally made a big impression was lasagna rolls! I came up with a few years ago and tweaked the ingredients over time. Plus my husband likes the crispy of the topping I have found away he can have the whole top this way! I have lost a lot of sleep over this lasagne…..it’s so delicious I can’t stop thinking about it. I sent this to all my friends and have forced them to cook it. It’s my evil plan to get invited over for dinner. Hi , i was wondering if i didn’t have any dry mushrooms what could i use in place of .. i have fresh mushrooms ? Hi Tracey, it won’t have quite the same impact, but fresh mushrooms will work if you mince them up finely and sauté them along with the onions. Hi Regine, sorry for the slow response. It’s a 10.5-inch square dish. As for the lasagne sheets, I think they’re half the size of US sheets. Excellent. I made it using a 9 inch square pan. I had not ye seen your response regarding the size of pan. Love the meat sauce. The only thing is that next time I will split the cheese and meat sauce in advance so that the amount in each layer is more even. I love the dried porcini in the sauce. Thanks for a great recipe.